In several earlier posts, I discussed the artistry and history of antique cufflinks. This month's note is about cufflinks as objects of personal adornment. These three factors - Artistry, History and Adornment - in large part explain the irresistible attraction of antique cufflinks. Together they constitute the "AHA Effect." The reasons individuals wear antique cufflinks are many. At the most rudimentary level cufflinks are functional - they hold a shirt cuff together. Beyond the utilitarian, a wearer may select a pair of antique cufflinks because he/she wishes to enjoy a miniature work of art and literally keep it close at hand. Another wearer may be motivated by a sense of history. While others may aspire to a public display of wealth. Fortuitously, the designs of antique cufflinks are as diverse as the motives of those who wear them. The period from 1880 to 1950 saw the creation of cufflinks in many distinct styles, ranging from Victorian to Art Nouveau, Edwardian to Art Deco. Among antique cufflinks there is something to suit almost any taste. This point is better illustrated with photographs than words. Below is a sampling of fine antique cufflinks from the 1890s until the 1940s. These cufflinks would beautifully adorn any cuff. 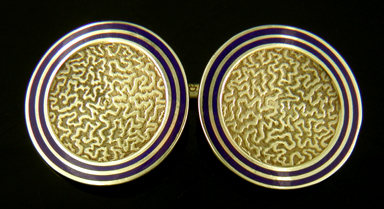 Striking guilloche enamel cufflinks with translucent purple enamel over an engine turned pattern of radiating ovals. A nice example of the beautifully crafted, bold designs created by Carrington & Co. during the 1920s and 1930s. Crafted in 14kt gold, circa 1930. Beautifully designed platinum and gold cufflinks with intricately engraved centers and platinum borders with Greek key accents. These elegant cufflinks were created around 1910 by one of the founding firm's of the American jewelry industry, Durand & Company. A menagerie of mythological creatures and exotic animals inhabit antique cufflinks. These cufflinks feature a roaring lion with striking eagle-like features. Crafted in 14kt gold, circa 1910. An exuberant pair of Art Deco cufflinks with radiant sunburst centers and black enamel accents. Engraved yellow and white gold borders complement the design with bold Art Deco motifs. Crafted in 14kt white and yellow gold, circa 1925. Wonderful white-on-white cufflinks featuring mother of pearl centers surrounded by elegantly scrolling white gold borders with a small pearl in the center. Crafted in 14kt gold , circa 1920. The elegance of the Edwardian era sparkles in these platinum and diamond cufflinks. The soft engraving of the platinum shimmers like watered silk. Crafted in platinum and 14kt gold, circa 1910. Beautifully crafted gold cufflinks in the Arts & Crafts style from Carrington & Co. The hand-hammered gold surfaces shimmer like sunlight sparkling on a gently rippling pool of water. Crafted in 14kt gold, circa 1900. The curving, intertwining lines of ancient Celtic design inspired beautiful cuff jewels during the 19th century Celtic Revival. Another example, of the late Victorian interest in ancient cultures. These finely crafted cufflinks were created by George O. Street in 14kt gold, circa 1900. Beautiful Tiffany Art Nouveau cufflinks featuring Old European Cut diamonds and blue Sapphires set amid flowing, intertwining curves. Crafted in 18kt gold, circa 1900.
found in the Antique Cufflink Gallery. Recent additions to the Antique Cufflink Gallery feature an elegant pair of Durand platinum and gold cufflinks, beautiful Moss Agates from Carter, Howe & Company, sparkling Edwardian diamond and platinum cufflinks, and frosty white gold snowflakes. Platinum and Gold! Beautifully designed platinum and gold cufflinks with intricately engraved centers and platinum borders with Greek or Chinese key accents. These elegant cufflinks were created by Durand & Company, circa 1910. Moss Agate III Beautiful eight-sided Moss Agates set in bright yellow gold. Created by one of the premier makers of fine cufflinks during the early 1900s. Crafted in 14t gold, circa 1910. Edwardian Elegance! Cushion-shape platinum top cufflinks that sparkle with the elegance of the Edwardian era. The softly engraved platinum shimmers like watered silk. Crafted in platinum and 14kt gold, circa 1910. Intricately Engraved! Beautifully engraved white gold cufflinks with elegant scroll borders. The dramatic borders feature winged volutes and small flowers at each corner. Crafted in 14kt white gold, circa 1920.